New iPhone/iPad App! It’s About Time You Got An Advanced Language Learning System For Your Device. It’s about time 2014 came around! It’s a magical time of year for language learners. New goals are set, new lessons are published, and new Innovative Language members are starting to speak their first Japanese words. You know what? It’s also about time you got our advanced language learning system access through an iPhone/iPad app! Because you want to take your language lessons on the go and pick up where you left off at your computer, and you won’t take NO for an answer! So before you ask…yes, this App exists! Yes, you can download it. And yes, there’s an Android version in the works. Say hello to the NEW Innovative Language Learning 101 App! Currently available for JapanesePod101.com but more languages will be added soon. Click here to download the Innovative Language Learning 101 App! Since most of you are already swiping and tapping on smartphones all day long, it only makes sense to extend your JapanesePod101 access across different devices. 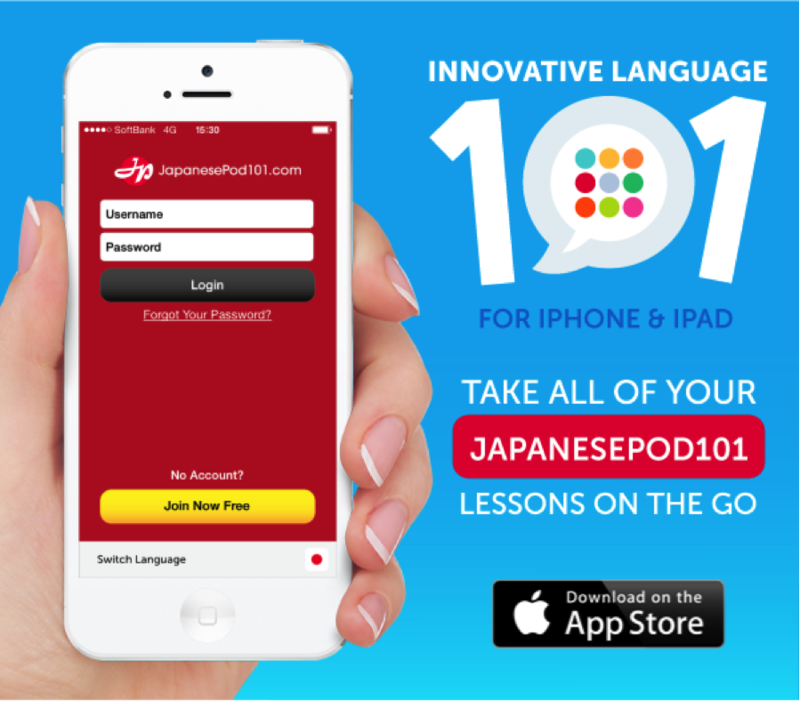 With the Innovative Language Learning 101 App, you can study Japanese on your iPhone on the go…with Lessons, Lesson Notes, Progress Tracking, Premium Tools…then, switch to your computer and continue. All your progress is saved through magic we won’t bore you with. The App itself is free to download on the iTunes Store. If you’re already a Free, Basic, Premium or Premium PLUS member, get the app and hop into your account. You’ve got instant access starting NOW. Stay tuned! More languages and an Android version are coming soon! In the meantime, let us know what you think! Download the app and start learning with our fully integrated system. Feel free to send us your feedback, suggestions, and of course, report the bugs! Looking for a new language to study? We’ve just added 2 new languages sites to the Innovative Language family which bring us to a total of 31 languages that you can learn the fast, fun and easy way! What are they? Based on user requests, we’ve launched Czech and Danish. Czech, believe it or not, used to be called “Bohemian” until sometime in the 19th century. It’s the official language of the Czech Republic, one of Europe’s most popular tourist destinations. And like all Slavic languages, Czech has a reputation for having lots of consonants clustered together. But don’t let that scare you away. Czech uses the Latin script, which makes it easier to learn than a character-based language like Russian. And it’s not too far from Russian either, so learning either language will give you a huge advantage with the other! Click here to sign up & take your first lesson at CzechClass101! Danish is a Scandinavian language and will be easy for any English speaker. Worrying about the alphabet? No need. The Danish Alphabet also uses the Latin script plus three additional letters, Æ, Ø, and Å. Danish is spoken by over 5.5 million people and Denmark is consistently rated as one of the happiest countries on Earth. So, if you’re looking to visit Denmark, make sure to drop by DanishClass101.com and take your first lesson! Click here to sign up & take your first lesson at DanishClass101! P.S. Join the Founding Fathers Club and learn Czech or Danish at 50% OFF for life! The Founding Fathers Club is a lifetime 50% discount exclusively for early adopters - more specifically, the first 101 subscribers per site. Learn for as low as $2/month for Basic or $5/month for Premium. The price will always be the same, even when the deal is gone. And the deal is gone once the first 101 spots are taken. 101 Spots! Click here to get 50% OFF for life at CzechClass101.com! 101 Spots! Click here to get 50% OFF for life at DanishClass101.com!